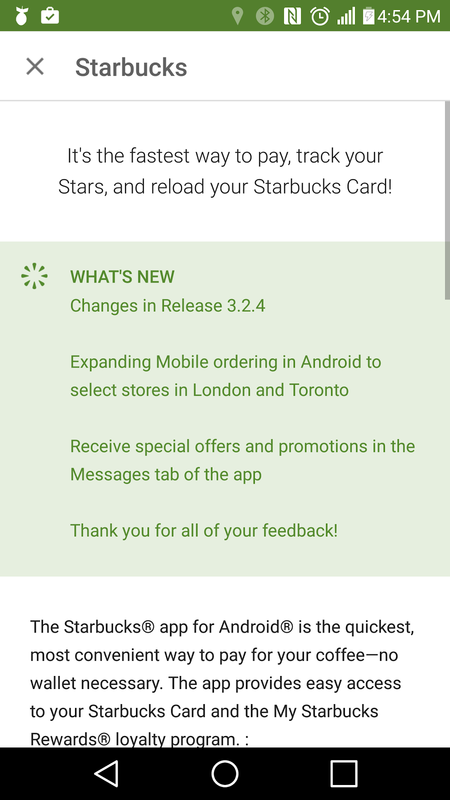 I really like the Starbucks app... a nice simple show of how paying for your items at a store should work (and how Android Pay should work once we get it). I'm hoping that they'll start allowing tap to pay versus scanning my screen (or in the case of most of the ones I go to they take my phone and punch in the numbers instead of scanning it). 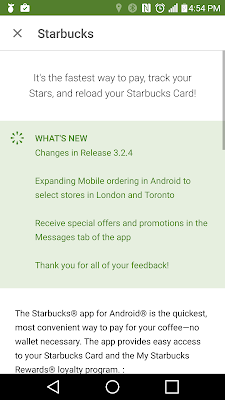 Recently they've had the app update where you can actually place your order in the app and just go to the location to pick it up. That's great, but the availability was very limited. Well, at least now in Toronto and London you can try it out. I can't see it on my device (because I'm not in those cities)... so if you are in the T-dot or in London, let us know how the system works.